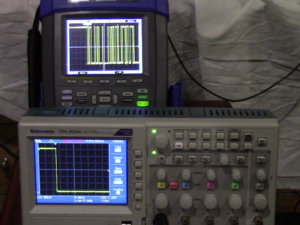 The test scenario was a practical application, observation of the data traffic to/from a DHT22 temperature and humidity sensor in the project ESP8266 IoT DHT22 temperature and humidity – evolution 2. Above is a screen shot of the menu bar repeated on the screen, the upper 66% of the menu display should have been erased when the menu function completed. Pressing some other buttons sometimes clears the menu from the display so that the full trace area is visible. Above, holding the up/down buttons of the timebase setting switch causes random button activation and activation of “auto” setting… requiring applying the desired settings again. This seemed to not happen if the repeat feature of the buttons was not used, but that makes use very tedious. 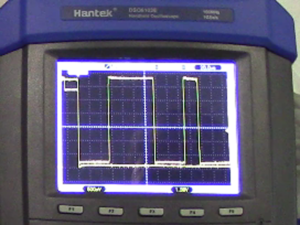 Above is a pic of the Hantek DSO8102E and Tek TDS2024C observing the same signal in normal trigger mode, and the Hantek failed to capture the waveform shown on the Tek probably due to excessive latency in the Hantek resulting in it missing the following trigger event well after the pulses that it did capture. 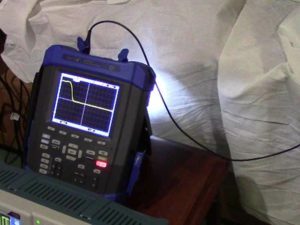 Above, the pulse shown on the display was not present on the input (a parallel scope was monitoring the same signal), the transition is spurious and it triggered the single trace mode and switched a LED flashlight on the rear on for no reason (there is no mention of a flashlight or camera light in the manual). 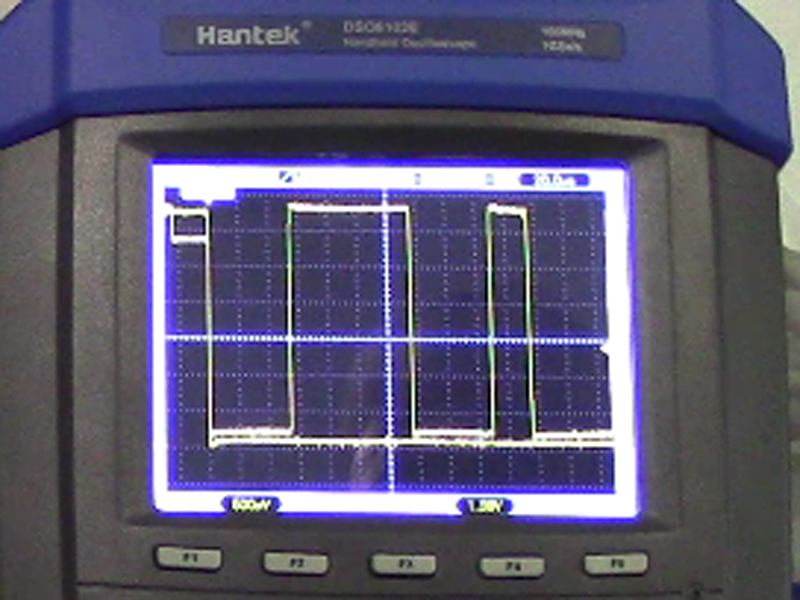 Above is a case where in normal trace trigger mode, it fails to erase the previous trace when drawing a new one, the rectangular pulses here a from a trace that should have been erased and the current even is simply a single -ve step about 2 div from left. 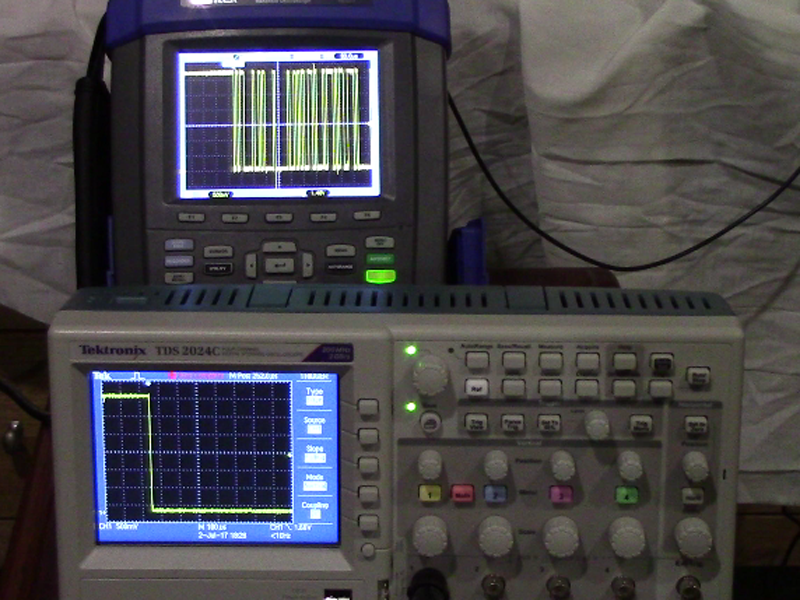 This becomes very confusing when rapidly changing waveforms are displayed. If the screen is printed, only the last trace is printed and it repaints the display without the stale trace. There were other lesser issues. Silicone buttons jam in the panel cutout. Compensation capacitor in one probe was very stiff and damaged the plastic trimmer screwdriver supplied with the probe. PC software would not work with the DSO8102E despite the driver installing ok and reporting all ok. The tests were not structured, and not comprehensive. All reported problems were revealed trying to display a waveform that was well understood and finding that the display on the Hanteck was not as expected. 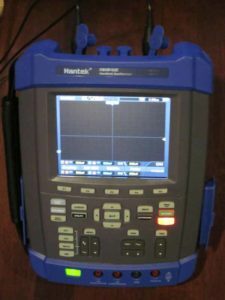 Hantek were contacted for assistance, but they gave none. The seller was more supportive than Hantek, and obliged with prompt handling of the problem and the return. A 100% feedback Chinese seller (which is a rarity) who deserved his rating. The DSO8102E is more than just an oscilloscope, it incorporates a waveform generator and DMM, but these functions were not evaluated due to serious failures of the oscilloscope function. The DSO8102E exhibited a wide range of defects, most of which were of themselves reason to reject the instrument. Assistance was sought from Hantek, but none was given. After a week of testing and no response from Hantek, the eBay return process was activated and the thing sent back to China. eBay seller protection was an important factor in risk assessment of the purchase, and as it turned out it was activated and saved an otherwise considerable monetary loss. 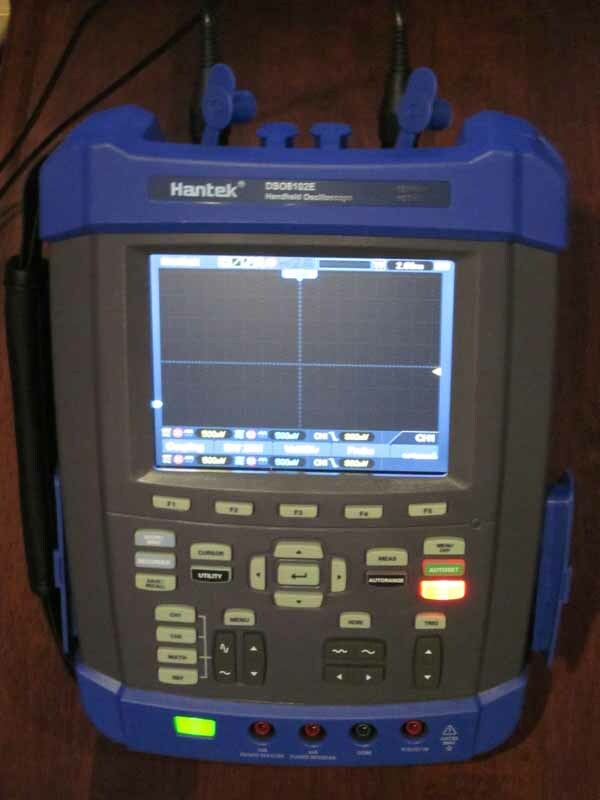 Hantek could be translated to “Chinese Tek”, but though my Tek TDS2024C is made in China, it is vastly superior to the Hantek which should probably be translated as “unsupported Chinese junk”. 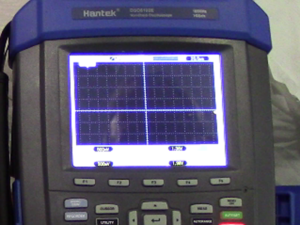 Had the thing worked properly, it would have been quite a good instrument, but it was plagued by so many problems that speak so loudly of Hantek.